With three boys under the age of five, we like to make a scene nearly anywhere we go. In fact, we don't even have to try very hard to call attention to ourselves, most of the time just being out and about with these three handsome dudes is enough. Most will tell you, I'm sure, that you could hear us coming long before you could see us. Needless to say, I've sure heard my fill of "you sure do have your hands full." 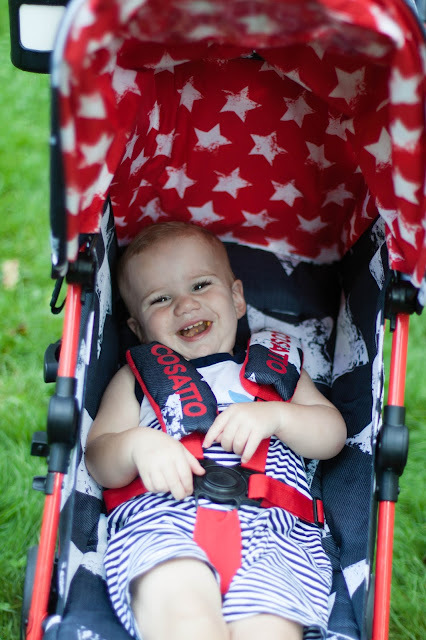 No matter where we go, if it isn't one of the boys calling attention to our special band of crazy then it's the mode of transportation we've chosen to bring along for the ride and the Cosatto Supa stroller with it's bright, bold and colorful print is no exception to the rule. 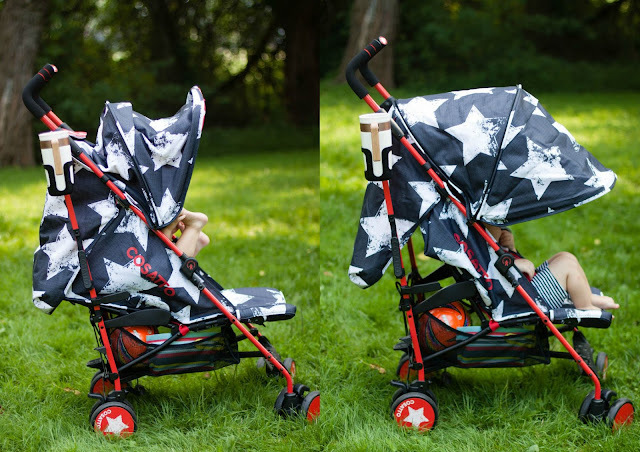 I want to refer to this stroller as an umbrella stroller but really, it's so much more than that. First off, there are some really great features I want to point out, like the fact that this stroller comes with everything you'll need to stroll in style with your babe. 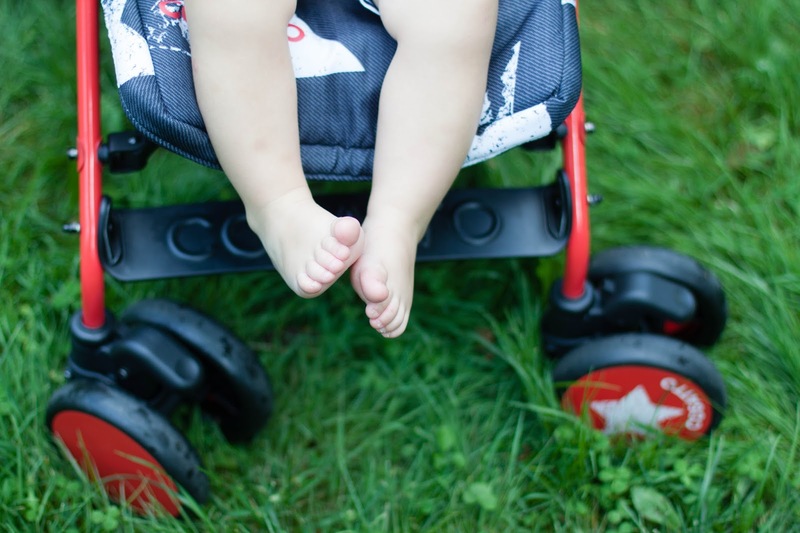 As in, there are no additional accessories you'll need to purchase such as a cup holder, foot muff or rain jacket, which seems to now be the norm with many strollers on the market. Everything that I mentioned above is included in the initial purchase of the stroller. Second this stroller features some really fantastic upgrades that I have yet to see on other comparable strollers on the market. 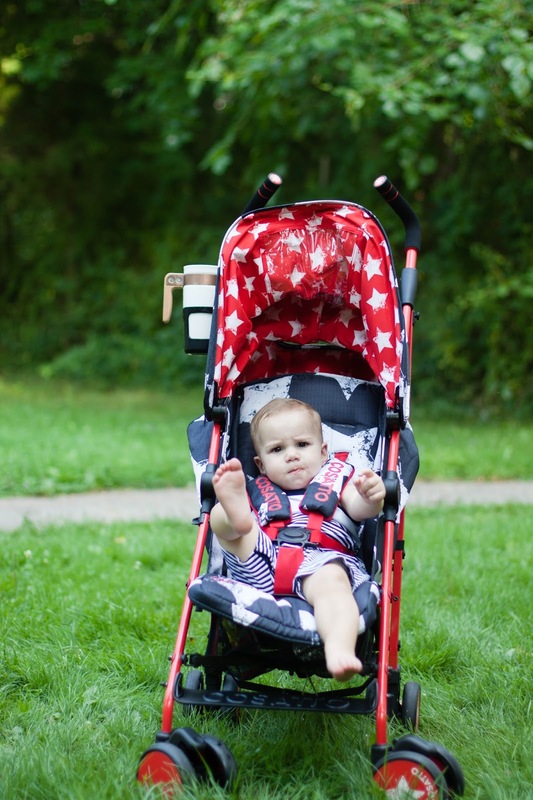 With a full recline position available, this stroller is suitable starting right from birth. What's more is that my 15-month old can sleep comfortably while out and about keeping up with the busy schedules of his two older brothers. The 4-position recline is fully adjustable with one hand making it cinch to adjust while on the go. Another fantastic bonus feature of the Cosatto Supa pushchair is the multimedia gadget pocket with optional speaker. I know this feature could rub some individuals the wrong way but the truth of the matter is that this handy dandy little tech pocket is worth it's weight in gold. Should you not want to insert a tablet or phone for media viewing into the sunshade of the stroller, you could easily slip a board book, photos or flash cards in there as well. Either way, whatever you decide to slip in that pocket is out of reach but well within view of the child riding in the stroller. When baby is happy, everyone is happy and sometimes that means a little Mickey Mouse Clubhouse while in line at the DMV. 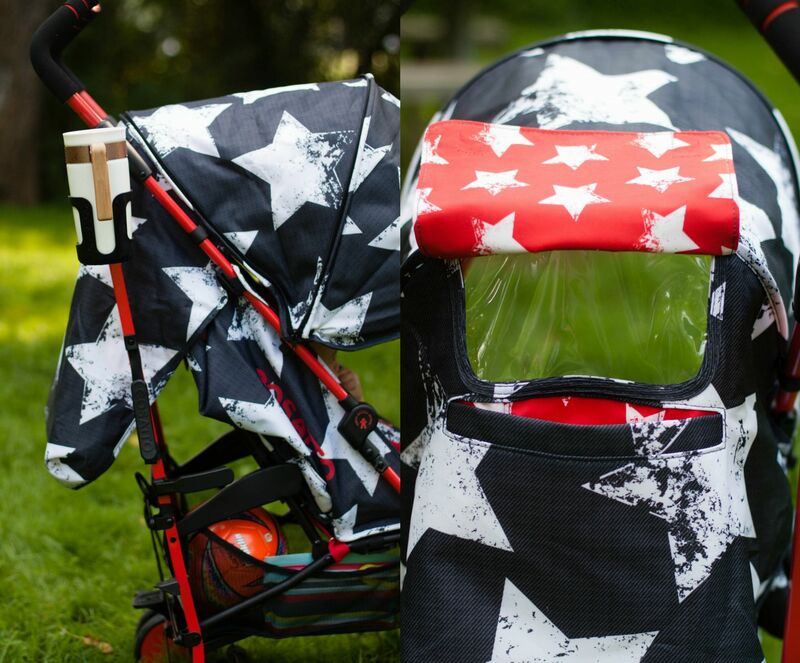 With an extendable sunshade and optional foot muff and rain cover, this stroller is suitable for all kinds of weather. Since we've been using our Supa during the summer months, we've gotten a lot of use and appreciation out of the extendable sunshade and as we march closer and closer into the Autumn months, I can't wait to try out the super soft and cozy foot muff. 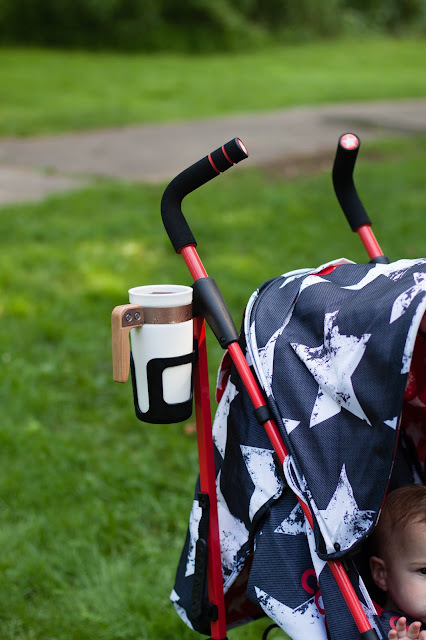 My husband's favorite features include the cup holder which can attach to either side of the stroller as well as the adjustable handlebars. One thing he cannot stand about a stroller is when it doesn't come with an adult cup holder and I can't say that I blame him! 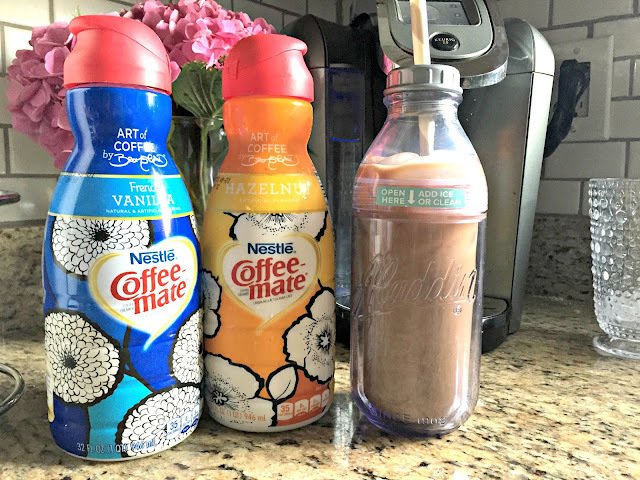 Whether it's an iced coffee or adult beverage, it's kept safe and well within reach on the Cosatto Supa. I keep this stroller in my truck at all times. While I have two or three strollers on constant rotation depending on which child I'm pushing or where we're heading for the day, this stroller is great to have on hand at all times. Not only is it lightweight and easy to store but it folds well and doesn't take up much space at all once in the car. Another feature that I've grown to appreciate is the auto kickstand that enables the stroller to stand up right even while folded. One last feature that can either make or break a stroller for me and our three boys is storage space. While I've had the luxury of strolling with some pretty amazing strollers, the truth is if it lacks storage, there really isn't a whole lot of room (no pun intended!) for that stroller in our daily routine. That said, between the decently sized storage basket that lies beneath the Supa as well as the handy little pocket on the back of the pushchair itself, there is plenty of storage to go around for our little family of five. While I can't necessarily store a large diaper bag beneath the stroller, I can stow away several water bottles, a diaper and wipes clutch, toys, a small kickball as well as three pairs of sunglasses, a water pistol, my car keys and two extra pairs of kid shoes. I have traveled with this stroller many places over the course of the last several weeks. 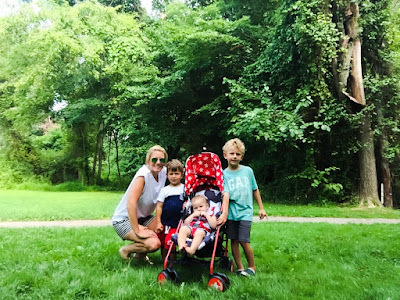 It has made the trek to the beach, the zoo, the popular park circuit in our neighborhood as well as a myriad of daily errands including but not limited to the grocery store, barber, pet store and beyond. It has stood up to the task of keeping up with our busy family of five while providing a safe and comfortable ride for both my 15 month old and 3 year old. 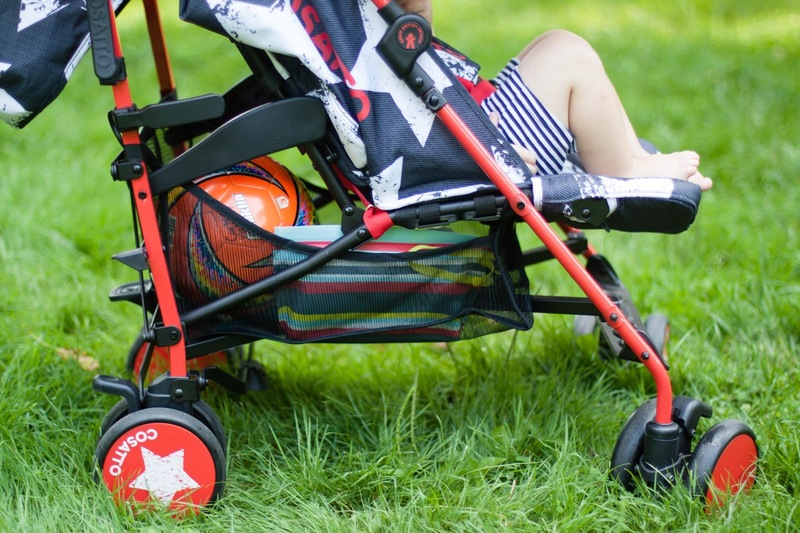 Additional noteworthy features of the Cosatto Supa include the easy to wash seat that pops right off, adjustable calf rest and lockable front wheel. If you ask me, Cosatto has thought of everything when it comes to the Cosatto Supa umbrella stroller. My hat is off to them. Tried and tested, this umbrella stroller receives ten thumbs up! 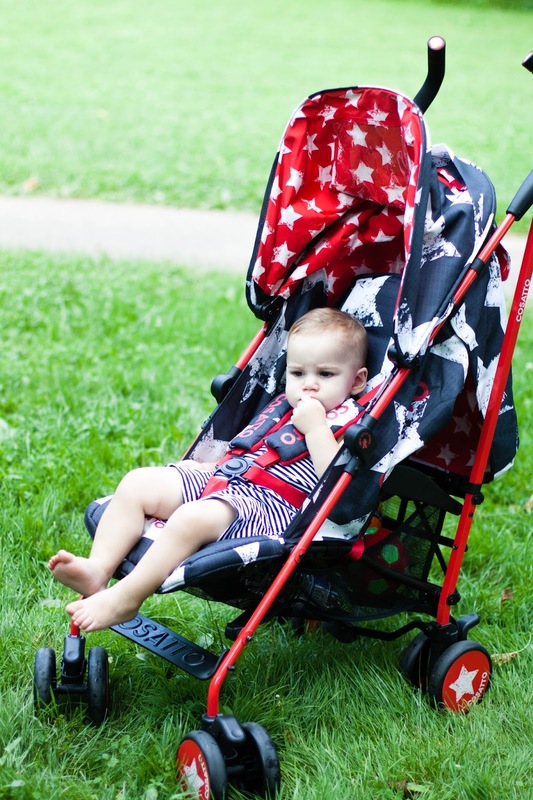 With its eye-catching design, outstanding features and superior quality, I wholly endorse this stroller! Way to go, Cosatto! You definitely take the boring out of baby products! Keep up with Cosatto online, on Facebook, Twitter and Instagram. 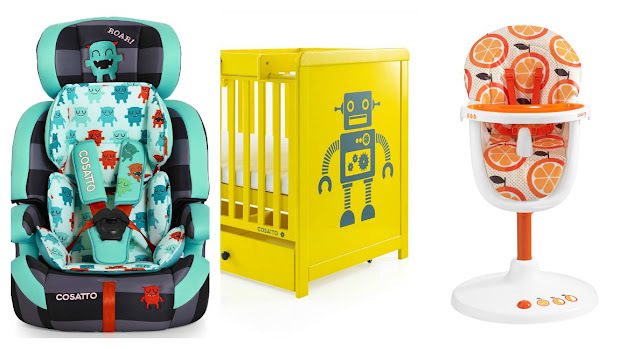 Additional Cosatto products that I love include car seats, high chairs and cribs! I received the Cosatto Supa stroller for free in exchange for my honest review and endorsement. No additional compensation was received and all thoughts expressed are honest and my own. 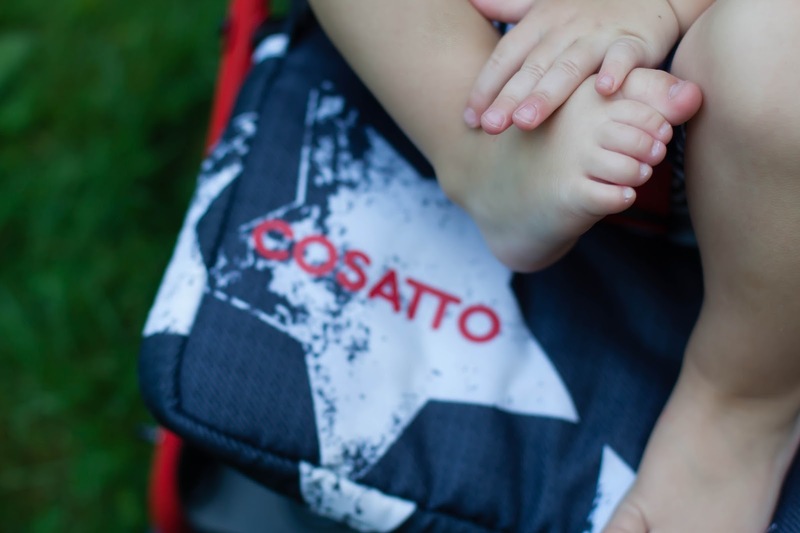 Thank you, Cosatto, for keeping this mom of three boys stylish while on the go! 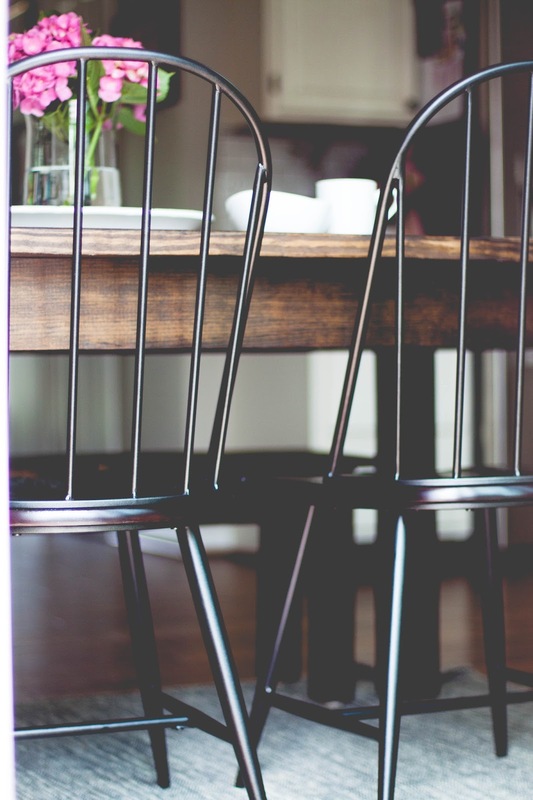 How A Farm Table Made Me Fall Back In Love With My Kitchen. Everywhere you turn it seems as if everyone has gotten the farm table memo. From Restoration Hardware, Arhaus and World Market to IKEA, Pinterest and beyond, these pieces of rustic furniture perfection have infiltrated kitchens and dining rooms everywhere. Moreover, they all seem to have gotten the stately, stunning and grandiose kitchen memo as well, a memo that has yet to find its way to me. Take for instance the kitchen of my dreams. Spacious with white cabinetry, stainless steel appliances, a butcher block island, a large farm table and a fancy chandelier. High ceilings, neutral colors and all of that kitchen pomp and circumstance are, quite literally, what my dreams are made of. While I love browsing Pinterest and spending weekends lazily watching HGTV and drawing inspiration and design ideas from these avenues, lately I find that it just leaves me feeling lacking. Lacking these beautiful, picture-perfect spaces and pining for something bigger and better. In contrast we have a relatively modest kitchen. 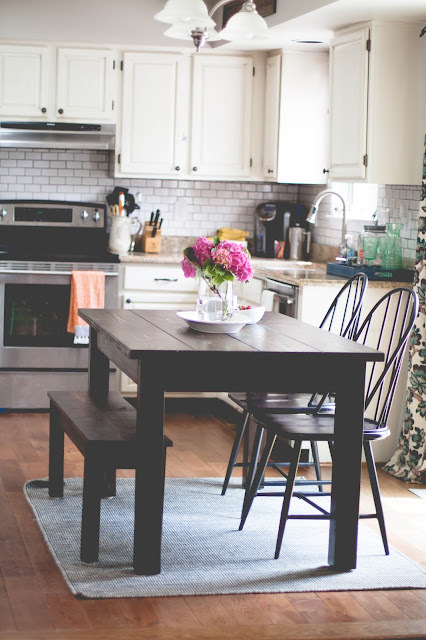 While it has come a long way from its days of peach-pink cabinets and grey laminate counter tops, it's not much compared to the pictures of the kitchens that infiltrate my dreams. It is, however, the heart of our home. The place where our family gathers for meals three times a day (and at least three more times for snacks, all the snacks)! It's where we share the highs and lows of our days and where I am regaled with the wild and crazy stories of my boys' imaginations. It's the place where my first baby took his very first steps and the hub of our home where we have nightly dance parties during the witching hour while we wait for Daddy to come home. When we first bought our home five years ago, we transformed that kitchen as a labor of love into something we could grow a family in. Into a place we could build our home on. I've cooked hundreds of meals and danced hundreds of dances around that kitchen with three babies on my hip and if it is at all possible to become emotionally attached to a kitchen, I'm your girl. I remind myself daily to work with what I've got and to place less significance over the things in my life. 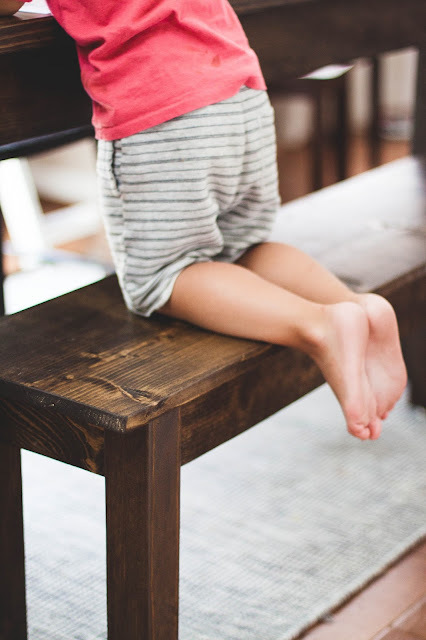 I love our kitchen but more importantly, I love the people whose laughter fills the room, whose little feet leave footprints all over the wood floors. 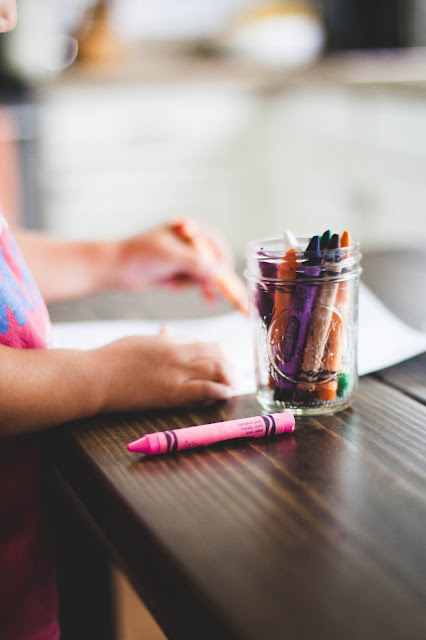 Even the little people who sometimes forget that crayons are just for paper, as evidenced by the walls and trim surrounding the pantry. It's not easy though, all of this being content with what you've got business, especially when you want to so badly for your home to be a reflection of who you are. I want my home to be a place that's inviting, creative, comfortable, warm and welcoming. Naturally, I want the inside to reflect that. While I can't rush out and buy a new home, I've started making smaller changes around the house that are both realistic and a reflection of our family. I've stopped purchasing home decor willy-nilly and now only purchase pieces with intention that I know will serve an important purpose within our home. I've swapped out old, dated furniture that was taking up space and rearranged current furniture to help attain the comfortable flow I'm aiming to achieve. Recently I swapped out our kitchen table for something that I've had my eye on for years: the elusive farm table. 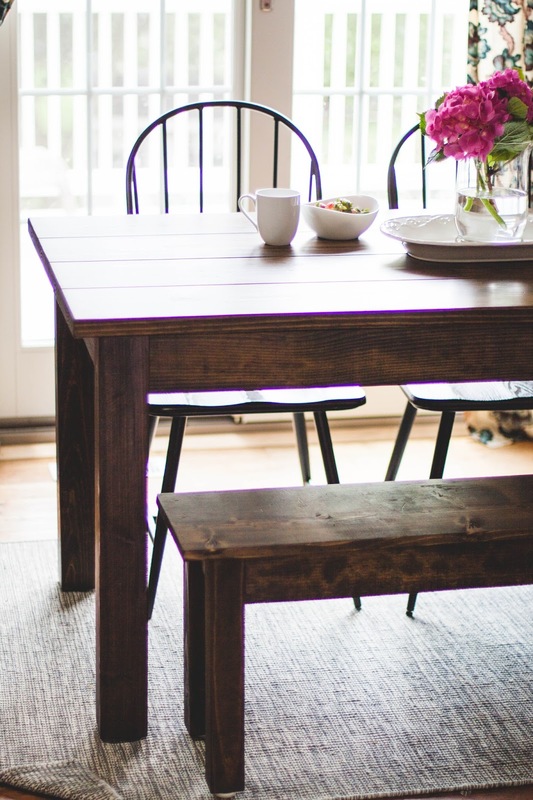 I LOVE having a rustic farm table for our crazy, beautiful party of five to gather around. 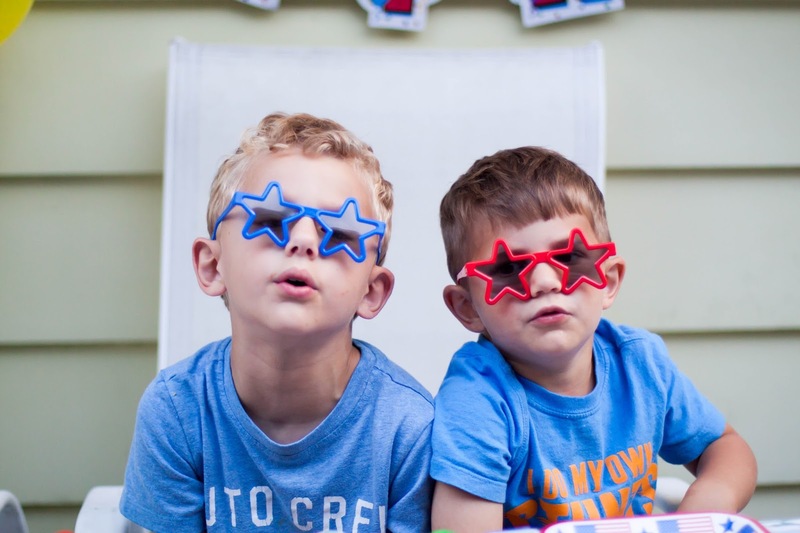 There's just something about seeing a set of brothers sitting side by side on the bench seat with their feet tucked under their bums, that makes me feel all of the feels. And what a difference it has made in our kitchen- the perfect blend of industrial and vintage, it serves that spot in our eat-in kitchen much better than our previous table. Our previous table was chipped and cracked. It bore four very sharp pointy corners that stuck out like daggers, just waiting to connect with a tiny forehead and I knew it was only a matter of time before that darn table sent us to the ER. Speaking small sets of small brothers- that's the great thing about farm tables- the more banged up they become, the more character they gain, making it the perfect table for our home. 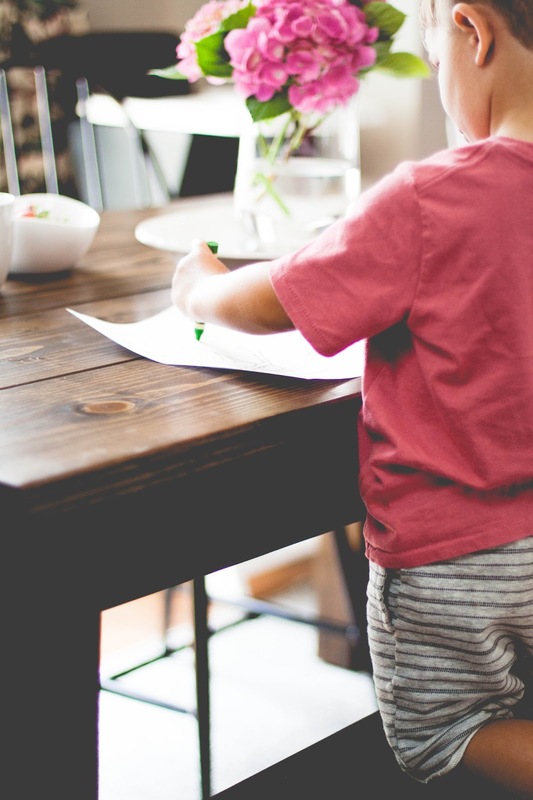 It's one of the secrets to owning nice things AND having small children in the house. Having nice things and small children is mostly all about casting an illusion. It's all smoke and mirrors, farm tables and slip covers. Whether I'm sitting down with a girlfriend catching up over coffee or sitting down with my three boys to tackle the latest set of beloved Duplos, our handcrafted, one of a kind farm table from Ezekiel & Stearns has become a favorite gathering spot for everyone who enters our home. 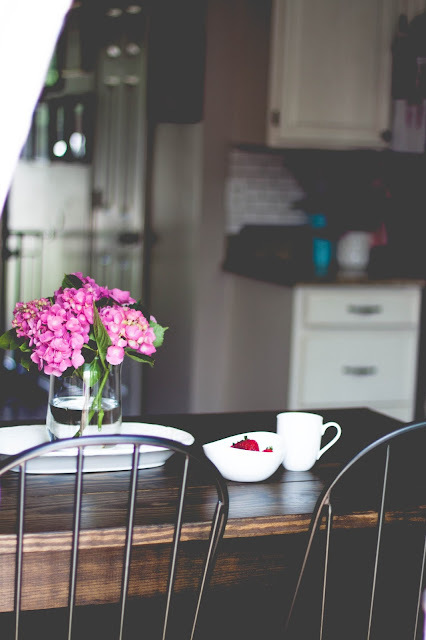 It has brought with it a new energy to that space and in its own way, allowed me to fall back in love with our kitchen, to find contentment in that space once again. Made from durable and solid wood, I know this table will be with us for many years to come and I cannot wait to create even more family memories as we gather around it. Without much space to work in, it's the perfect size and shape for our modest eat-in kitchen. Are you looking to transform your space? 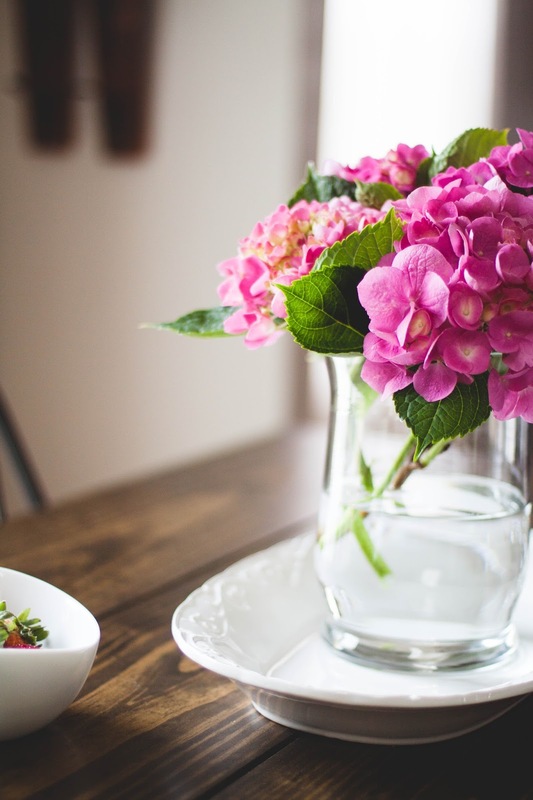 Perhaps breathe a little new life into an existing nook or room of your home? The kind and amazing hands behind Ezekiel & Stearns are currently offering $100 off ANY custom handcrafted table with the code CARROTS100. They're also giving away one piece of custom furniture valued up to $250! I encourage you to visit their website and check out some of the amazing, beautiful pieces they can build. Coffee tables, sofa tables, kitchen islands and more- I guarantee you will have a difficult time narrowing down all of the options! Not to mention that it's all made right here in the US. "We consider what we do art, and our pieces can be found in homes across America. We focus on design which elicits the romance of history and a sense of place through the use of the timeless production method of handcrafting. Our designs are an inspired combination of strength and beauty. All of our pieces are made with care one at a time out of solid wood." Connect with Ezekiel & Stearns on their website, Facebook page and Instagram account. Enter the giveaway using the Rafflecopter widget below. Be sure to read through all terms and conditions before entering and Good Luck! I received product for free in exchange for this post. I did not receive additional compensation and all thoughts and opinions expressed are honest and my own.